Sunday is a big food prep day for me. 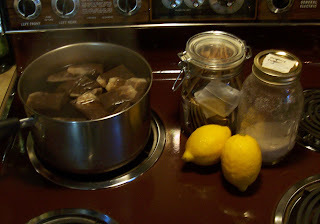 I also usually brew a big batch if iced tea to last me through the week. The process is so easy and the final result is much more delicious than what you would get from any powdered mix! I generally make a simple batch with red or black tea, some lemons, and sugar, but this can be customized... try it with green tea, raspberry tea, or adding honey. Bring a big pot of water to a boil. Pop in some tea bags (I use 12-15 depending on my mood) and let steep for around 10 minutes. Remove the tea bags and squeeze in the juice of the lemons. Add sugar to taste (I use around 2 ounces), mix, pour into a large jug, and chill. Depending on how much I brew or how many tea bags I use, I occasionally dilute the iced tea with some more water, but certainly anything goes depending on how you take your tea!